Gow, J.i.. "Government". The Canadian Encyclopedia, 27 January 2016, Historica Canada. https://www.thecanadianencyclopedia.ca/en/article/government. Accessed 18 April 2019. Canada’s federal and provincial governments are divided into three branches — the legislative, executive and judicial. The Centre Block of the Parliament Buildings is home to the two federal legislative houses - the House of Commons and the Senate (photo by James H. Marsh). 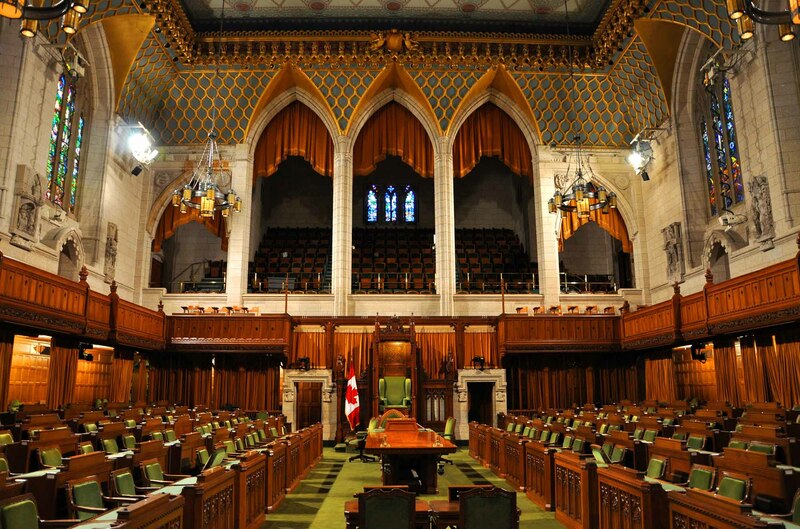 Canada’s federal and provincial governments are divided into three branches — the legislative, executive and judicial. Together, the branches pass and administer laws. The executive also administers a vast array of programs and services, from tax collecting to national security, and from the provision of health care to the maintenance of highways. Government in its narrow sense may refer to the group of ministers comprising the Cabinet — for example, "the Trudeau government." Or it may mean the whole apparatus of the state — including the Cabinet, the legislature, the courts, the civil service, the Armed Forces and so on. A third meaning has to do with the exercise of power. Governments have power over society as a whole and individuals in particular. In this way, governments are different from other organizations because of their ability to make and enforce rules for the whole society. Democratic governments, such as Canada's, receive their power from citizens, via the process of periodic elections. In Canada, government's legitimacy comes from the Constitution. The powers of the government are divided among the legislative, executive and judicial branches. The legislature's (or Parliament's) elected representatives make laws and vote on taxes and spending. The executive proposes laws, presents budgets to the legislature, and implements laws. The judiciary is the final interpreter of the laws. In the parliamentary tradition inherited from Britain, the executive (the Cabinet) must resign when it fails to maintain the confidence of the majority of the members of the legislature. This is the meaning of responsible government —the executive is "responsible" to the legislature and receives its power from the legislature, which, in turn, receives its power from citizens. In addition, courts and judges must be free to interpret the laws without interference from Cabinet ministers or members of the legislature. In recent decades this balance of power between the executive, legislature and judiciary has been threatened by the growth of the executive, partly the result of the complexities of expanding state responsibilities in modern times. Federally and provincially, the executive has three separate parts. The head of state is the Canadian monarch, currently Queen Elizabeth II. The head of state is represented in Canada by the governor general, and in the provinces by the lieutenant-governors. They must approve laws and important executive decisions before they come into effect. However, by convention, if the Cabinet has the support of a majority of the legislature, the head of state's approval of its decisions is purely formal. The second part of the executive is the Cabinet, comprising the prime minister (in the case of the federal government) or premier (in the case of provincial governments) and ministers chosen by the prime minister/premier. Most Cabinet ministers are also members of the legislature, but this is not a legal requirement. Prime ministers and premiers are typically the leaders of the party with the most seats in the legislature. Ministers are usually appointed to head a government department, but some will be given co-ordinating posts and others will have special duties — for example, the supervisor of the government's agenda in the legislature, or government leader in the Senate. 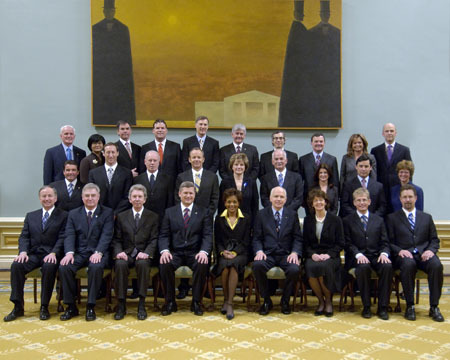 Governor General Micha\u00eblle Jean, poses with Prime Minister Stephen Harper and his cabinet on 6 February 2006, at Rideau Hall. (photo by Cpl Issa Paré, courtesy Rideau Hall). The third and largest part of the executive is the administration — the government departments and agencies, the Armed Forces, and various autonomous bodies. While departments are the basic organs of administration, answering through their minister to the legislature, the autonomous bodies, such as Crown corporations and regulatory commissions, have more specific roles. Other government-appointed boards run public insurance and loan schemes, while administrative tribunals are used to resolve disputes administer programs in areas such as taxation, immigration and social services. 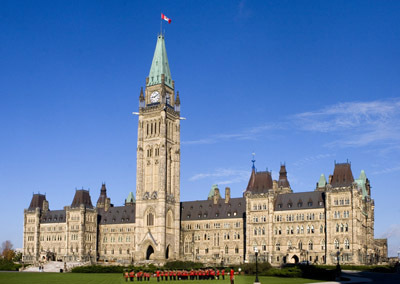 Canada has national, provincial and municipal levels of government. However, only the first two have powers under the Constitution, which other levels cannot undermine (see Distribution of Powers). Municipal (or local) governments have only those powers that are granted to them by their provincial governments. One significant difference between municipal and higher levels of government is that municipalities do not raise income taxes. 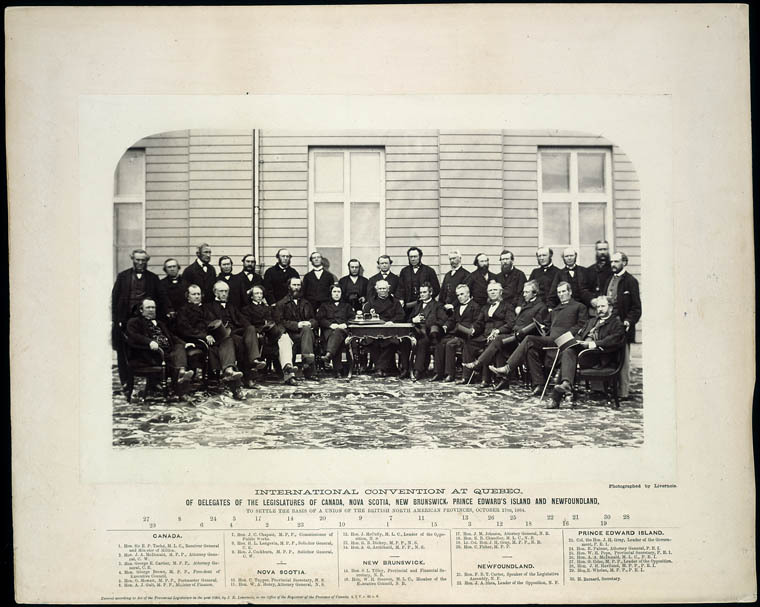 One of the important changes in Canadian government since Confederation in 1867 has been the assumption by the national and provincial governments of functions once belonging to municipalities. 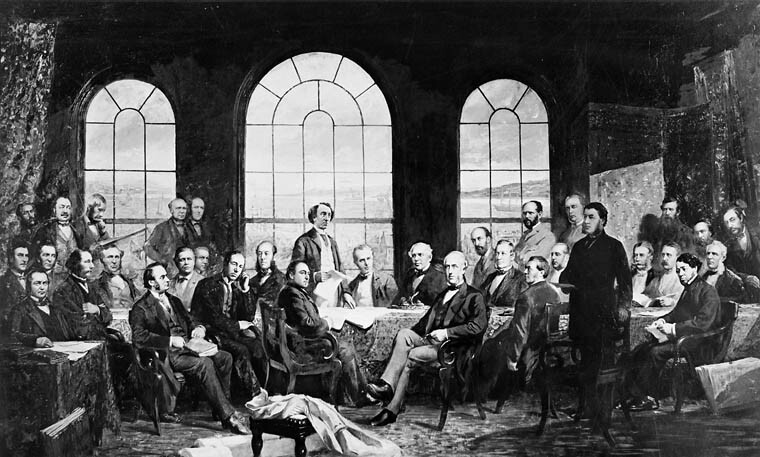 In 1867, the British North America Act gave the federal government authority over defence and external affairs, criminal law, money and banking, trade, transportation, citizenship and Indian affairs. The provinces were to be responsible for education, civil law (including property and civil rights), health and welfare, natural resources and local government. The federal and provincial levels were assigned joint jurisdiction over agriculture and immigration and, as it evolved, over most revenue sources. Changing social and economic conditions, and changing ideas about the proper role of government, have brought each level of government into prominence at various times. In the 19th century, the main philosophy was laissez-faire economics — non-intervention by government in economic life. However, during this period the federal government became a prominent force in the economy through the encouragement of railway-building. Ottawa used a combination of land and money grants to entice private companies to build and expand railways, first the Intercolonial to the Maritimes, then the Canadian Pacific to the West. The provincial governments also supported railways, but were not as actively engaged in this aspect of growing the economy, and the country, as the federal government. From 1900 to 1930 (with the exception of the First World War years from 1914–18), the provinces became the most active level of government. Rising prosperity brought higher revenues to provincial governments. They built dams and highways and extended school and health services. Canada's new urban, industrial and commercial life led to government regulation of health and safety, of trade practices and of highway traffic — all provincial responsibilities. Depression and war, however, brought the federal government again to the forefront. In both the First and Second World Wars, Ottawa not only directed Canada's military effort, but used the powers given to the Cabinet by the War Measures Act to direct the economy. Federal taxation expanded greatly during the wars . The federal government also took the lead in organizing relief measures during the Great Depression. Various joint federal-provincial programs were created for public works, as well as for the provision of direct relief to struggling, unemployed, and hungry Canadians. After the Royal Commission on Dominion-Provincial Relations (1937–40), the federal government proposed that it assume responsibility for regulating the economy and for the most important social insurance programs, in exchange for the lion's share of government revenues. The provinces rejected this proposal at a conference in 1941, but many of the ideas were still introduced piecemeal. By constitutional amendment, with the consent of the provinces, the federal government was given responsibility for unemployment insurance in 1940 and old-age pensions in 1951. Also with provincial consent, family allowances were created by federal law in 1944, and the Canada Pension Plan in 1965. Conditional financial grants (or shared-cost federal-provincial programs) were used increasingly in the post-Second World War period by Ottawa to prod the provinces to action in fields such as highway construction (the Trans-Canada Highway), post-secondary and university education, unemployment assistance, hospital insurance and health insurance. Because of these initiatives, and because of the federal government's prominent role in defence measures during the early decades of the Cold War, the provinces did not achieve until well into the 1960s the kind of primacy they had enjoyed in the 1920s. While many foreign observers say that Canada is a very decentralized state with strong powers belonging to the provinces, many provinces continue to feel that the federal government interferes in provincial areas of jurisdiction. For its part, as costs of government soared in the late 1970s, the federal government tried to find ways to limit its expenses, especially in health and higher education programs. Limits on federal activity also occurred in the late 20th Century, as Québec created its own programs in areas such as tax collection, job training and pensions; as Nova Scotia and Newfoundland gained control over offshore petroleum revenues; and as the three northern territories gained increasing autonomy from Ottawa over their affairs. Québec Parliament. 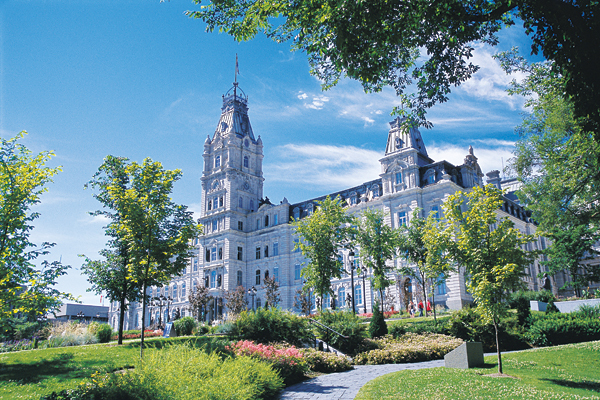 Credit: Jean-Guy Lavoie, Quebec City Tourism. With the growth of the welfare state, and increasing government management of the economy, the administrations of all levels of government have expanded and become increasingly difficult to control. The number of people working directly or indirectly for government represents more than 20 per cent of the labour force — a percentage that is rising. The size and complexity of government departments have challenged the principle of ministerial responsibility for the actions of those departments. Members of Parliament now have difficulty trying to oversee the complex activities of the government and the administration. The role of the courts is being taken over in many cases by administrative tribunals. Amid this growth in government complexity and power, the measures taken to control government power include the creation of ombudsmen, and freedom of information laws — which have made some government information open to public scrutiny. The Charter of Rights and Freedoms has also enabled the courts to invalidate certain laws or administrative actions that infringe on basic personal freedoms or rights. With increasing complexity and power come increasing government costs. As a result, repeated budget deficits led most Canadian governments into a financial crisis in the 1990s. To meet the challenge, they adopted some mix of the three strategies described below. First, they tried to downsize by cutting budgets and staff, selling public assets such as crown corporations, and contracting out services that they previously produced. Second, they tried to change the role of the state by eliminating programs and activities. Third, they changed the way they operated by adopting management techniques from the private sector — to become more flexible, decentralized and responsible, and less centralized and bureaucratic. At the beginning of the 21st Century, the federal and some provincial governments achieved their first budget surpluses in many decades — although this phenomenon was interrupted by the 2008 global financial crisis. The result in Canada was both a return to budget deficits — as a result of massive government spending and intervention to maintain the financial system and boost the economy — and the continued growth of government authority, control and power. Michael M. Atkinson, Governing Canada (1993); Stephen Brooks, Canadian Democracy (1993); Rand Dyck, Provincial Politics (1986); Eugene Forsey, How Canadians Govern Themselves, 5th ed (2003); Richard M. Burd, Who Decides? Government in the New Millennium (2004); Stephen Brooks, Canadian Democracy: An Introduction, 4th ed (2004). The federal government's primer for newcomerson provincial and territorial government.